Two years have passed since Quentin Tarantino's last film, the Grindhouse piece Death Proof, and five years since the closing half of his proper opus, Kill Bill Vol. 1 & 2. And while Death Proof is considered an excellent appetizer, it appeared to me to be more like a directing exercise for Tarantino than an actual project of his desire. Almost as if it was more fun to work with Robert Rodriguez on a joint venture, and to take a break following the Kill Bill films, than to create another sprawling masterwork. Fortunately, starting in late 2008, Tarantino tackled a project he'd always talked of undertaking: a massive World War Two genre film. Something fit into a historical context such as this would potentially allow Tarantino to use his broad film knowledge to alter the traditional views of a war film. And then this week, Inglourious Basterds premiered garnering a lot of solid reviews, none terrible, but some less than wholly complementary. As a stalwart Tarantino fan, ever since I first saw Pulp Fiction in my friend's basement during junior high, I held high hopes for this movie, but was not exactly sure what to expect. 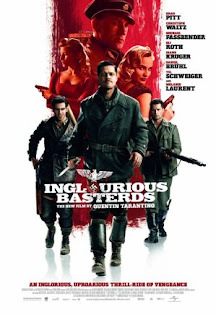 After viewing, Inglourious Basterds may not be Tarantino's best film, but it is definitely the one with the broadest scope and most interesting storyline. The film opens in the Nazi-occupied French countryside, as Christoph Waltz playing Colonel Hans Landa (known also as "The Jew Hunter") interrogates dairy farmer Denis Menochet about a Jewish family he believes Roth is harboring. Classic Tarantino dialogue presents itself straightaway, as Waltz's Landa quickly presents himself as cunning, charming, and evil in a slightly cartoonish, but ultimately self-serving way. Characterization has always been a Tarantino strong suit. It is very clear who these people are by the things they say. Dialogue is everywhere in this film, and long conversations with minimal blocking perfectly complement the action sequences we expect from Tarantino. Despite the amazing amount of dialogue, too, in this nearly three hour long film, not one word feels wasted or unnecessary. Many people are quick to applaud Tarantino for his genre knowledge and shot selection, but his writing is what keeps an audience from noticing that they've been in the theater for hours. And he knows enough to write a WWII movie in the languages of the peoples involved. Subtitles rage throughout. Personally, I love subtitles. Mostly because I revile films, such as Tom Cruise's Valkyrie, that use actors with British accents, speaking English and pretend that an audience is meant to accept that as German for the American palate. Tarantino brilliantly works with his subtitles, allowing the characters to speak English at times, but only after setting up that they're bi- or tri-lingual, outside of the French, German, and Italian that would be more common to the area. The film is violent, and graphic at times as one should, nay, must expect from Tarantino. Of course, much of the violence is exaggerated for comedic effect (also to be expected). But, Tarantino's violence is no longer the impressive part of his work. His storytelling, and the web of characters and situations he creates is his greatest asset. Inglourious Basterds involves plots to kill Hitler, Goebbels (whose own film-making allows for a subtle, but brilliant bit of self-reflexivity), and other key Nazi leaders at a film premier in an alternate history. The litany of characters who cross paths, creates a tapestry of emotions that often go incompletely spoken as they are interrupted by the chaos of war. There is something like a love sub-plot existing in the film, very nearly, but the context of violence, racism, fear, hate, and war mute love to the greatest extent. Moments of compassion are always rewarded with violence, rather than compassion in turn. Tarantino says a lot about war, that despite holding brutality close in his writing, there seems to often be a feeling that compromise was available, but ignored. At times, the film seems to protest war, in a tongue-in-cheek manner. Characterization in the film is phenomenal. Not one actor fails in their design or performance. And given all the dialogue, that is a heavy compliment. Brad Pitt is hilarious, and exceptional as 1st Lieutenant Aldo Raine. Eli Roth shines as Bostonian Staff Sergeant Donny Donowitz aka "The Bear Jew". Melanie Laurent, as Shoshonna, and Diane Kruger, as Bridget von Hammersmark, both give exceptional depth and brilliance to strong, complex female characters. The greatest performance goes to Christoph Waltz, who ultimately carries the suspense of the film and has the broadest range of acting to do. Tarantino even seems to inject a bit of himself into Lt. Archie Hicox, played by Michael Fassbender, who is a British officer and former film critic who infuses quippy genre/movement knowledge into the film. And there are other surprises, too, that keep the action and pace of the film flying along. Inglourious Basterds reinvents the war movie genre, but never bastardizes it (pardon the pun). Tarantino takes his audience on another emotional roller coaster that is at times nauseatingly horrific, and heart-sinkingly emotional. We are treated to know a lot of different characters in the film, though never brandished melodramatically, who generate tangible emotional response. It's a solid Quentin Tarantino outing. He maintains his evasive style, wherein you can only expect the violence and the dialogue, but you're never sure what to expect from his inventive writing. And it's nice to still be surprised by a director, or a movie when the cookie cutter in Hollywood is so often applied.